It’s always important to remember that passing your paramedic course is just one part of the overall equation. You have to pass the National Registry Exam as well. It is created by the NREMT, which registers emergency medical providers all throughout the United States. There are several factors that will determine your chances at passing the NREMT exam. Examples of these factors are your academic performance, the school you took a course in paramedics at, and your preparation for the examination. Most graduates of paramedic education programs flunk the NREMT paramedic exam because they are inadequately prepared for it. Just because you finished the course does not mean you will pass the test. But you need that certification before you can put your training to practice and earn money. 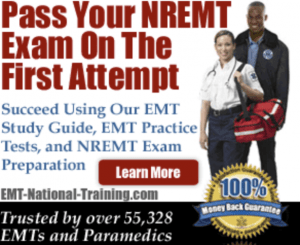 Note: if you’re serious about passing the NREMT exam, you can find online EMT and Paramedic practice tests that will try to help you pass the examination on your first attempt. Most states require paramedics to pass the NREMT exam. Only Illinois, Wyoming, North Carolina, New York, Massachusetts, and Florida have other types of tests. However, the NREMT-P exam is the standard. Unlike other tests for paramedics, this one is harder and better tests the proficiency and readiness of the test takers. Take note that thr NREMT is a private organization that invests a huge amount of money in making standardized exams for prospective paramedics. It is hard to fool this exam because it uses a system that tests how well you know your course. The kind of questions you get depends on your answers. So your answer to a question determines what the next question is. This is unlike conventional tests that allow you to guess your way up to the last question. This exam is run by a system (Computer Adaptive Test) that determines whether you are bluffing or you really know what you are doing. Paramedic practice tests raise your chances of passing the actual exam. Practice tests actually acquaint you with the real exam and make you figure out your weak spots, areas where you may need to study more to improve. Take, for example, the comprehensive study course at emt-national-training.com entitled Online EMT and Paramedic Practice Tests. This particular site takes you through multiple areas of the national registry test, and each area has 15 sample questions for you. What’s great about going through this particular site and purchasing their study material is that they have study guides and preparatory exams for every level of EMS. So whether you’re an first responder, an EMT-Basic, an EMT-Intermediate, or someone looking to pass the paramedic exam, you’ll be covered. Another website that offers practice tests for paramedics is, simply put, tests.com. This one has thirty questions and gives you the percentage of your score right after finishing it. There are more tests on the Internet, but just keep in mind that any free practice test will never be comprehensive. You may want to check out paid review materials and comprehensive practice tests for more depth, analysis, and overall aid. The good thing about taking practice tests is you encounter random questions and then assess your readiness for the real examination. You cannot take the actual test if you are ill-prepared for it. Practice tests should be part of your review sessions. Make sure you cover main areas—airway, cardiology, trauma, medical, EMS Operations, and OP/Ped/Special patients. The methodology varies from person to person. Some people prefer to do practice tests first, while others refresh themselves with the lessons before assessing themselves through trial tests. Would-be paramedics are expected to be well-versed in all areas. No area should be left behind during reviews. It really boils down to how much you are familiar with the course and all the lessons. Random questions will test how deep your knowledge is in all areas. You may think you can focus on some areas and disregard others. Don’t do this. If anybody says so, because they have taken the exam and they seem to not have encountered questions in one or two areas, or because they thought there were more questions in some areas, don’t take their word for it. This exam varies from person to person. As mentioned earlier, the questions depend on your answers. So, as expected, you won’t be getting exactly the same questions as the next person. The tests on some websites are designed in such a way that you don’t see all questions at once. Instead you have to answer an item before proceeding to the next item. Look at a question in a sample about Airway and Breathing, for example. The choices are 2 LPM, 8 LPM, 12 LPM, and 6 LPM. LPM stands for liters per minute. The tests go deeper, of course, and you may encounter questions like differentiating symptoms of placenta previa and abruption placenta. If you don’t know the answers, then you probably should review your textbooks and class notes. In fact, you should devote a week studying your books in all subject areas of the curriculum. Make sure you are focused on the books—not Facebook. Make sure you are familiar with conditions paramedics usually encounter when responding to emergency situations. By the time you finish reviewing all the subjects, you should already be familiar with symptoms of different conditions, physical assessment of victims, and emergency procedures. You should be familiar with different types of shocks—cardiovascular, respiratory, metabolic, psychogenic, and so on. As you see in the practice tests, questions are generally situational, because they are supposed to gauge your familiarity in different situations involving injuries and medical emergencies. This is not your usual high school science quiz. Questions and certain scenarios can get tricky. Pay attention to words like NOT, EXCEPT, MOST IMPORTANT, NEXT, and LEAST. Reading questions carefully is one key to getting the right answer. Now keep in mind that questions will increase in complexity to test your mastery and understanding of the curriculum. The first several questions may test your knowledge. These are often more simplified questions that you can answer a bit easier. Then the test progresses to more complicated situations to truly test your knowledge, so it’s crucial to stay focused. Understand the question. Don’t assume right away. Pay attention to the choices. There may be more than one right answer, but there’s only one absolute answer. Pay attention to critical scenarios raised in questions. Leave no question unanswered. You can’t advance to the next question without answering the previous question in real NREMT-P Computer Adaptive Test. Be time conscious. You don’t have forever to ruminate on a single item. Keep in mind, if you can’t hack it in the practice tests, you won’t hack it in the real test. So make sure you’re truly ready before you schedule your exam. And if you not, seek out the proper resources so that you can pass the NREMT exam on your first try. If you’re ready to get serious about your test prep, sign up to get your Online EMT and Paramedic Practice Tests at EMT National Training. Paramedic Training Spot is the best online resource to find specific information on how you can become a paramedic.